Yesterday a friend of mine(S) shared with me a little trick to cook Mushrooms. S’s friend B, an excellent cook had passed on the trick of cooking mushrooms. B’s suggestion – Remove the stalk of the mushrooms and placing the mushrooms on a hot tawa and letting it cook in its own moisture. I decided to give it my own twist for today’s breakfast. I had exactly five mushrooms left in my fridge. And I was tired of making mushroom omelette. So, I decided to replicate S’s advice. I rinsed the mushrooms, removed the stalk and coated the mushrooms with a pinch of salt and some Italian seasoning. I placed them neatly on the hot fry pan and after it was half way cooked I turned them upside down and added my favourite ingredient, i.e, Garlic. I had finely sliced the garlic and added one slice of garlic to each mushroom and let it cook. I thought of giving my usual crisp toasts a miss and settled for the beans and peas. I blanched the beans and peas and once the mushrooms were done I removed them from the fry pan and added the beans and peas to infuse the flavours. To finish it off I added pumpkin seeds. Now comes Plating .I recollected how the renowned Chef Vineet Bhatia in one of the episodes on Twist of Taste aired on Fox Traveller(the episode on Amritsar) had neatly arranged the jalebi sticks in rectangle shaped rows. Inspired by that, I neatly arranged the beans in a rectangle format with two columns. I placed the mushrooms inside the columns and poured over the green peas and toasted pumpkin seeds. And this is what it looked like. A little twist to my usual breakfast tasted refreshing on a freezing morning. So, what twist did you add to your breakfast? Try out this recipe, give it your own twist and share it with us. While cleaning the kitchen storeroom I discovered my Mom’s good old oven with a glass lid which she once used to bake cakes for us. The oven is 15 years old so I was quite sceptical if everything was fine but did a test run on 31 December by cooking a successful Moussaka ( a chicken one ) for my mother’s birthday. After the successful experiment, my mother and my cousin requested me to prepare a chicken version of Greek Shepherd’s Pie for a family dinner on Sunday night. After a good run of the recipes available online I decided to stick to the recipe posted by Angeldrawers in Nigella Lawson’s website. 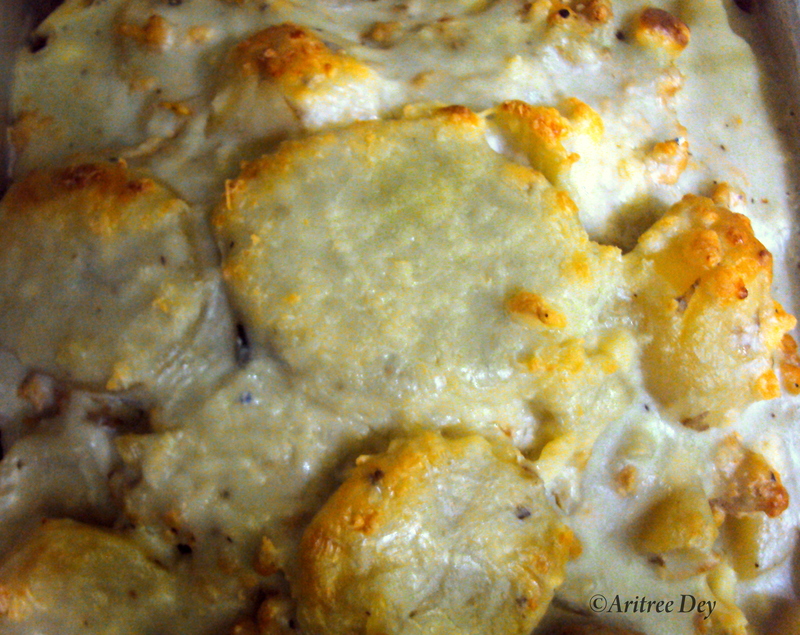 ( For details see http://www.nigella.com/recipes/view/greek-shepherds-pie-3981) . It was no joke to feed 7 people who has a penchant to offer you critical feedback though their facial gestures moment they bite into your dish. Instead of lamb / beef mince, I went for chicken mince( because my mother is allergic to red meat) and to give it a red colour I marinated it in red pepper sauce, a pinch of pepper, generous squeeze of lemon and salt as required. After giving it a resting time for three to four hours for the flavours to seal I went on to chop two medium-sized onions, and two medium-sized tomatoes. I fried the onions in butter (a good generous helping and no cheating on that), let the onions turn golden before adding the minced meat. Though the main recipe tells us to add the chopped tomatoes before adding the mince; in my desperate attempt to have a red colour I consciously chose to add the chopped tomatoes so that the mince would cook nicely in the juicy liquid of the tomatoes. After that it was time to check the seasoning and keep it aside. Once the meat was ready, it was time to boil the thinly sliced potatoes and simultaneously prepare the white sauce in a saucepan with a generous spoonful of butter. 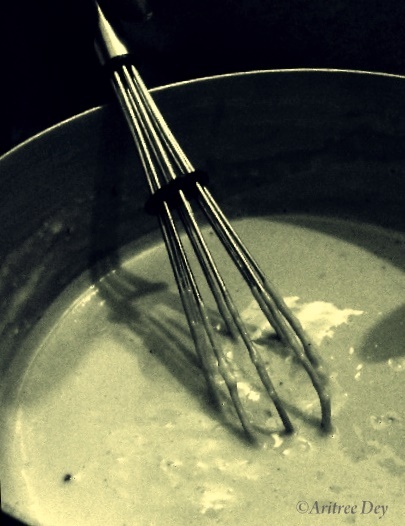 Once the butter started melting I added two cloves so that my white sauce has a lovely aroma. To that, I added milk(room temperature) and flour. Now comes the fun part of stirring it continuously to avoid lumps. 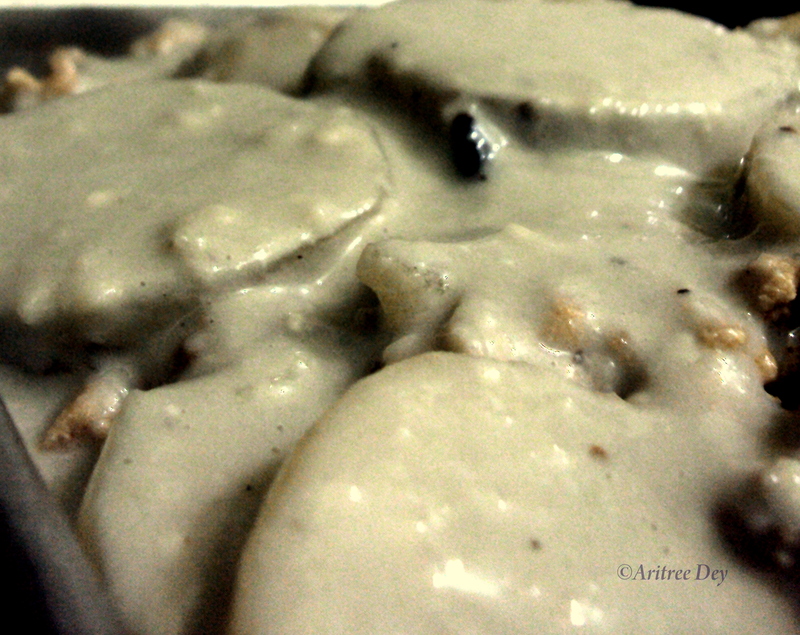 Once it attained a creamy texture I added an egg (a light deviation from the recipe). It was time to assemble the three components into a pie dish. For this, I strictly followed step no 5 in the recipe. 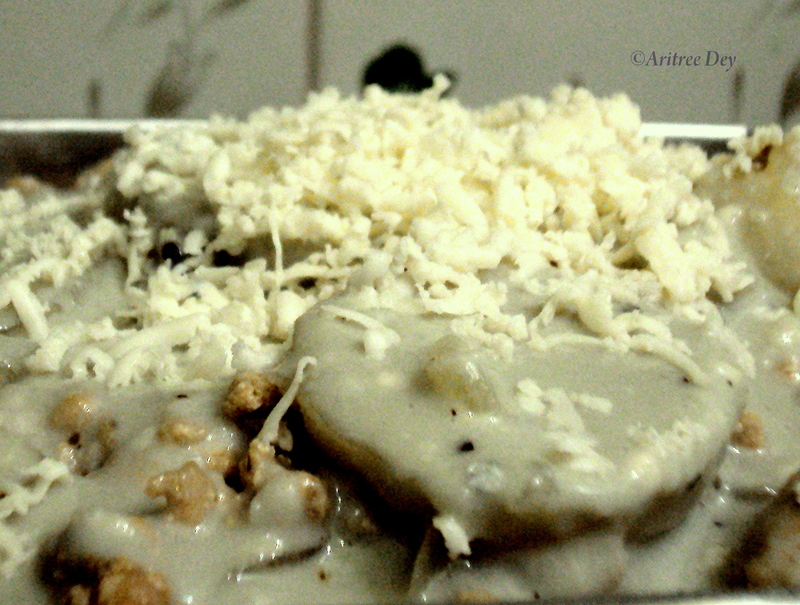 I added layers of potato and mince before finishing the last layer with potato, white sauce and of course grated cheese. After that it was time to bake. I baked the dish for around 30 min. Once the potatoes turned golden brown it was time to switch off the oven, get ready for my salad ( see next post). While I have found joys of baking I still have a long way to go and hopefully by end of winter I will have a successful list of bakes to share with you.